Recreational vehicle sales are at all time high and smartphones might have something to do with it. In the past year, dealers across the nation sold a staggering 430,000 RVs. According to the RV Industry Association, that's an increase of 15% over the previous year. So why the sudden interest in RV camping? Some of it has to do with low gas prices and easy credit. But a majority of the new fondness for the recreational vehicles is technology like smartphones and 4G data. It has made driving around the country for extended periods less overwhelming. Now millennials, who grew up surrounded by technology are reaching RV-buying age. They are young, ready for adventure and love to travel. In fact, more than half of RV buyers are under the age of 45, per the RV Industry Association. Many younger buyers are attracted to the small and sleek campers, like the Alto Pop-up camper. It's great for individuals or couples because it's small and easy to tow, but still has the comforts of home. Companies like Airstream are producing new camper models specifically targeting millennials. The new Basecamp trailer takes the classic shiny aluminum Airstream style and wraps it around a compact trailer with a nifty retro-modern interior. The product has been a success, according to Airstream's CEO. They have a wholesale backlog out until the end of 2017. RVs like the Basecamp are reasonably priced, starting at under $40,000, which make them within reach of many buyers. With the recent boom in RV sales, RV campgrounds are seeing higher numbers than they have in a long time. So grab your iPhone and hit the open road. A world of adventure awaits you. Watch out, tennis because there's a new sport in town. A combination of tennis, badminton and table tennis, pickleball is one of the fastest growing sports in America. It's a great way to get active for young and old alike. In fact, it's becoming so popular one business was able to go from an online store to a retail store in just three years. Pickle Pro started off selling pickleball paddles online, and was able to open up a store four years ago in Naples Florida. The owner says the company grows about 150% per year. For two years, more than 1,300 athletes compete in the U.S. Open, a seven-day national pickleball tournament held at East Naples Commuity Park. That's a 40% increase in participants from the first tournament held in 2016. Although the sport is growing in popularity across the nation, Florida is becoming a hub for pickle-ball lovers everywhere. The U.S. Open is helping Naples become the 'Pickleball Capital of the World'. While in town, local stores sell everything from paddles and balls to special shoes designed with pickleball in mind. Players say the sport is addicting, and it's being touted as the number one way for active adults to stay in shape. It's great cardio, while being easy on joints. This combination is causing 55+ communities to start adding pickleball courts to their list of amenities. At Newby Management, we are no exception. 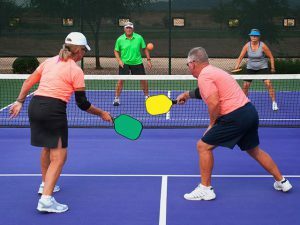 In fact, many of our RV communities now have dedicated pickleball courts, along with hosted games and even tournaments. With Florida's year-round beautiful weather, there's never a bad time to get outside and see why pickleball is America's new favorite sport. The smell of barbecue chicken wafts through the summer air. It's a smell that creates memories and brings them back for residents at Newby Management's RV communities. For the residents, it's about more than a BBQ, it's a time to connect with friends, to relax and to enjoy their community. For the Newby Management corporate team, the Summer BBQ's are about living out one of the company's core values: Servanthood. It states: "With Jesus as our example, we will strive to graciously serve our customers, investors, and fellow team members to the highest level possible. Each of us agrees to be accountable to a higher authority." 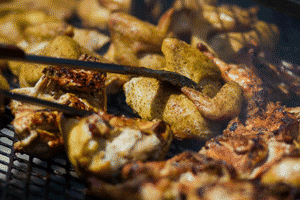 serve up grilled chicken, potato salad, beans, dinner roll and a large cake at our RV Resorts. 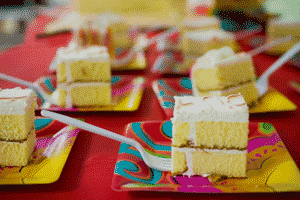 Themes create a fun and exciting atmosphere, different years have featured fiestas, the 70's and more! As you can imagine, a lot of logistics go into a BBQ for an entire RV community! In some larger communities, our team may cook over 400 pieces of chicken. This means we start at dawn and turn the grill four times! You definitely won't go away hungry from one of our shindigs either. We give very specific instructions to local butchers on how to quarter the chicken so each serving is huge. That's right! We not only serve big pieces of chicken, but we also use local butchers near the community we're serving. When a resident comes through our line, they can be assured that we temp tested the chicken before it leaves the grill, so we can be sure it's cooked thoroughly. Then comes the fun part: deciding whether you want light or dark meat. Delicious! You can get a piece plain or drenched in Sweet Baby Ray's BBQ Sauce. We love summertime because it means an opportunity to serve our residents and give back to our communities with a good old-fashioned southern BBQ. To our team, these are times of great fellowship and fun. They are a time to create new memories and reflect on past memories. They are a time to remind our residents that we are on their side. And of course, we can't forget the delicious food!